In an interview shortly before his death in 1983, Hergé, the creator of Tintin, said that the only person who could bring his creation to life on the big screen was a young director called Steven Spielberg. The director himself had only been turned on to Tintin two years earlier after critics pointed out that Raiders of the Lost Ark had bottled much of the young reporter's spirit of exploration and proclivity for raiding tombs. 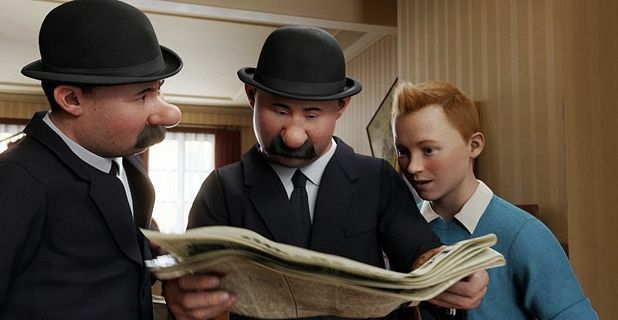 Almost thirty years on and Belgium's boy wonder has finally received the grand cinema treatment Hergé had wished for, supervised by another heavyweight in production – Lord of the Rings' Peter Jackson. Penned by Dr Who scribe Steven Moffat, Edgar Wright (Hot Fuzz) and Joe Cornish (Attack the Block), the script focuses on the eleventh book, The Secret of the Unicorn, with elements from its sequel Red Rackham's Treasure, and The Crab With the Golden Claws. The choice of books blends well, although some additions feel out of place. In particular, the denouement feels heavy handed and lacks Hergé’s light touch. After buying a seemingly innocuous replica model ship (The Unicorn) at a flea market, Tintin (Jamie Bell) is embroiled in a world of subterfuge, taking him across the sea where he meets the ship's drunk captain Haddock (Andy Serkis), descendent of Sir Francis Haddock who commanded the original full-size Unicorn. Together they must work to unlock its secret and thwart the machinations of the mysterious Ivanovich Sakharine (Daniel Craig). As Tintin, Bell excels in a role which has always been deliberately underwritten. He has no history, no family, no determinate age, yet Bell carries off his eager Boy Scout qualities without ever overplaying it. Serkis is well experienced in motion capture, from Gollum in Lord of the Rings to King Kong. His performance perfectly encapsulates the pathos, idiocy and ultimate heroism of Captain Haddock. There's plenty of humour too, much of it brought about by the antics of Snowy, Tintin's faithful dog, here portrayed without the power of speech but with hilarious anthropomorphic intellect. Using ‘the volume’, the motion capture system developed by James Cameron for Avatar, Spielberg melds Hergé's trademark caricatures with the aesthetics of 1930s continental Europe, although the writer's trademark ligne claire (clear line) artwork is given short shrift in order to bring the world to life. Indeed, it's a world full of detail and incident, although the director's virtual camera rarely has time to dwell on such things. Not since Indy's third outing has Spielberg felt so fresh and unshackled. From the endlessly imaginative transitions (sand dunes become crashing waves, a rowing boat at sea magically turns into a puddle), to an extraordinary chase through a North African town where the camera breathlessly defies the laws of physics, it feels like a hark back to the heydays of 1980s adventure cinema. After buying a replica model ship at a flea market, Tintin (Bell) is embroiled in a world of subterfuge. Not since Indy's third outing has Spielberg felt so fresh and unshackled; it feels like a hark back to the heyday of 1980s adventure cinema.